Pampas grass is a popular landscape plant that is commonly seen in the home garden. Many homeowners use it to mark property lines, hide ugly fences or even as a windbreak. Pampas grass can grow quite large, over 6-feet with a 3-foot spread. Due to its size and numerous seeds, some people find pampas grass control a concern plus it is considered invasive in some areas. Thus, learning what kills pampas grass is important. Continue reading to learn how to remove pampas grass. Pampas grass plants, native to Chile, Argentina and Brazil, are perennial grasses that grow immensely large with saw-toothed leaves and large pink or white, showy plumes. Although many home gardeners plant pampas grass for its elegant appearance and hardy nature, it can become a problem in some areas. The grass is not picky about soil or sunlight but does best in some sun and loamy soil. Pampas grass seeds freely and can eventually crowd out native plants. It can also create a fire hazard in some areas and interfere with grazing land. This is especially true in California, Africa and New Zealand where pampas grass is clearly recognized as an invasive plant. Each plant can contain up to 100,000 seeds per flower head that are quickly dispersed in the wind. Cutting the grass down in the early spring encourages new growth the following season and can sometimes alleviate issues with seeds. Caution must be taken when working with pampas grass, however, as the leaves are exceedingly sharp and can cause razor-like cuts. How Can I Get Rid of Pampas Grass? Some people try to remove pampas grass manually only to find that it has a massive root system. Digging the grass up is not an entirely full proof way to rid your landscape of the grass. The best possible pampas grass control involves a combination of physical and chemical methods. Because it is a grass, it is best to first cut it as close to the ground as possible. Once the grass is cut down, you can apply an herbicide such as Roundup. 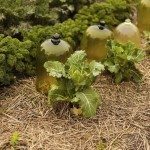 Several treatments may be necessary for established plants. For more information on what kills pampas grass, check with your local Cooperative Extension Office for advice. 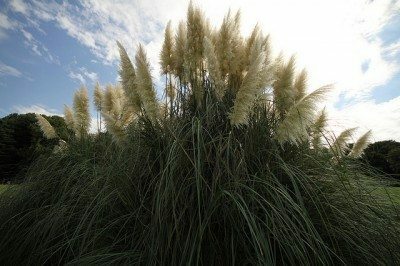 Read more articles about Pampas Grass.